I love potatoes. I could eat them every day but try to keep them on a four day rotation. I seem to crave them often. On Thanksgiving my mother-in-law use to make me my very own bowl full of mashed potatoes. They were creamy with lots of butter and milk. I can’t have them any more and sure miss them. But there tons of ways to make mashed and smashed potatoes that taste great. I love using almond milk and Earth Balance Buttery Spread. Also chicken stock tastes great with some chipotle in adobo mixed in for a nice kick. 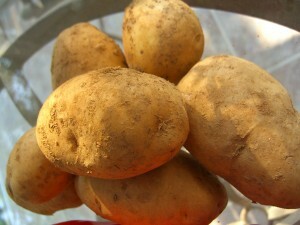 I love potatoes boiled, baked, fried, roasted, sauteed and even raw with a just a little salt. Give me red, golden, purple, new, old, fingerling, russet, concord, bintje, early chio, german butterball, la ratte or any varieties from Australia and the UK. If you live in Australia or the UK I’d love to hear what the popular varieties are there. Potatoes are rich in Vitamin B6, contain more Vitamin C than an average orange and have decent amounts of niacin, iodine, folic acid, copper and magnesium. They also offer 5 percent of their mass to protein. I’m sure you’ve all heard by now where most of this wonderful nutrition is stored, in or just under the skin. So if you don’t have to peel them, don’t. I hope you will share your potato recipes with us here. 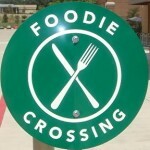 For all the rules check out Friday Foodie Fix. Seasoned Fingerling Potatoes, Roasted Pee Wee Potatoes with Mushrooms and Green Beans, and Hand Cut Oven Fries. 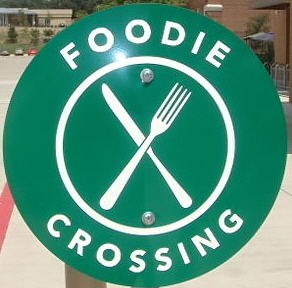 Next week’s Secret Ingredient is ………………….. Figs! I love potatoes too. There are many varieties and different ways to fix them. My grandmother used to make the most wonderful mashed potatoes with home made butter, fresh milk, and parsley. Linda- I really miss that type of mashed potatoes. I think I've found a great substitute however. Can't wait to make some more this month.